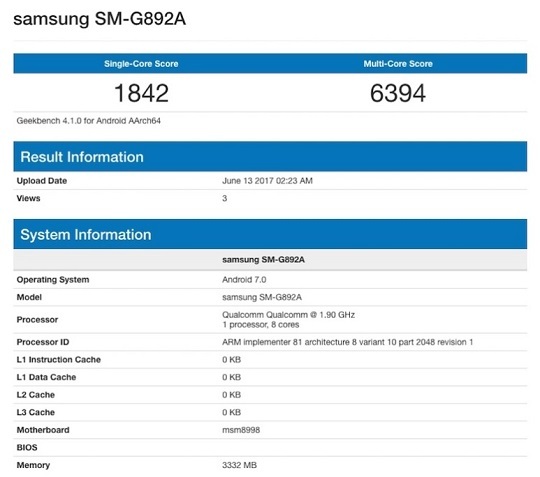 Samsung's upcoming device for AT&T called the Galaxy S8 Active has been spotted on GFXBench, revealing some of its key specs such as its chipset and operating system. According to the GFXBench listing, the new Galaxy S8 Active with model number SM-G892A will be powered by Qualcomm's Snapdragon 835 octa-core chipset that is clocked at 1.9GHz, paired with 4G of memory. It got a score of 1842 points in single-core and 6394 in multi-core. The Galaxy S8 Active is also revealed to run on Android 7.0 Nougat OS. Meanwhile, rumored specs include most of those from the Galaxy S8 such as a 5.8-inch display with a resolution of 2960 x 1440, 64GB of internal storage, 12-megapixel rear camera with dual-pixel PDAF, and an 8-megapixel secondary camera with autofocus. Apparently, there won't be the curved edges of the S8's Infinity Display. It will come with a more rugged body instead built for users who sport an active lifestyle. The Samsung Galaxy S8 Active is a smartphone designed in partnership with American telecommunications company AT&T. No word yet as to when they plan to launch the device.